Shotgun News Magazine is edited for anyone serious about buying, selling, or trading firearms. Whether you collect, hunt, target shoot, have personal defense needs or some other firearms interest you'll find the largest variety and best prices on all the firearms, accessories and services that you could want or need! 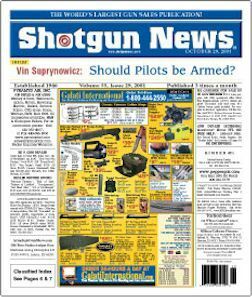 Each issue of ShotgunNews Magazine presents thousands of rifles, shotguns, revolvers and pistols of all ages, makes and models as well as exciting military products and collectibles, ammunition, edged weapons, optics, mounts, gunsmithing services, books, maps and a host of other related firearms products. There's simply no better way to find firearms than with a subscription to ShotgunNewsMagazine! We currently do not offer SHOTGUN NEWS SUBSCRIPTIONS.